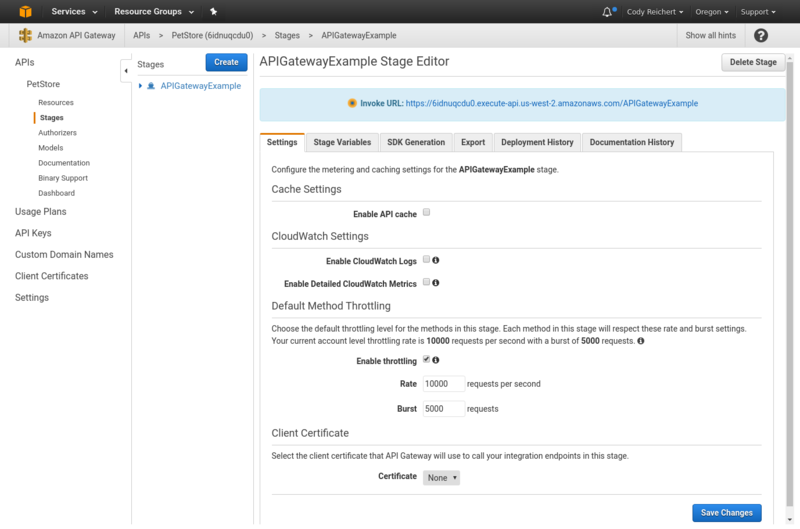 AWS's API Gateway is a great tool that makes it easy for developers to create and publish an API. In this post, I'll show you how to set up automated API testing and monitoring for all of your endpoints. 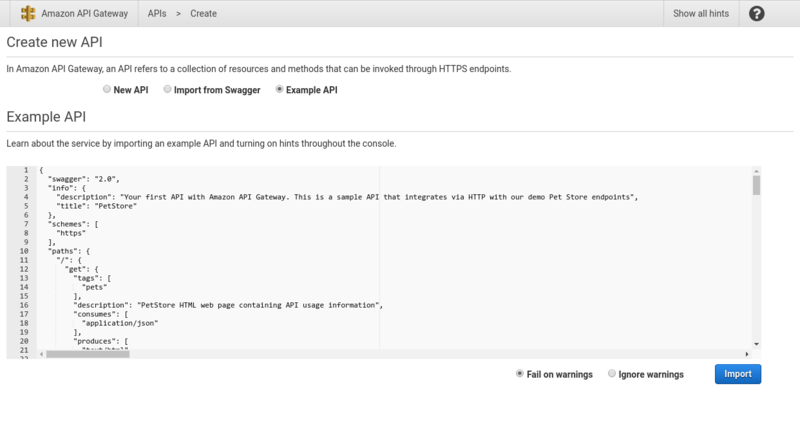 Amazon's API Gateway is a tool for developers to easily create, document, and publish APIs. As with any API, automated testing and monitoring provides another layer of security that your services are available and working as expected. It's easy to create create an automated test suite for your API Gateway endpoints by exporting your API as a Swagger specification and importing it into Assertible. This will take you to a Create new API page. 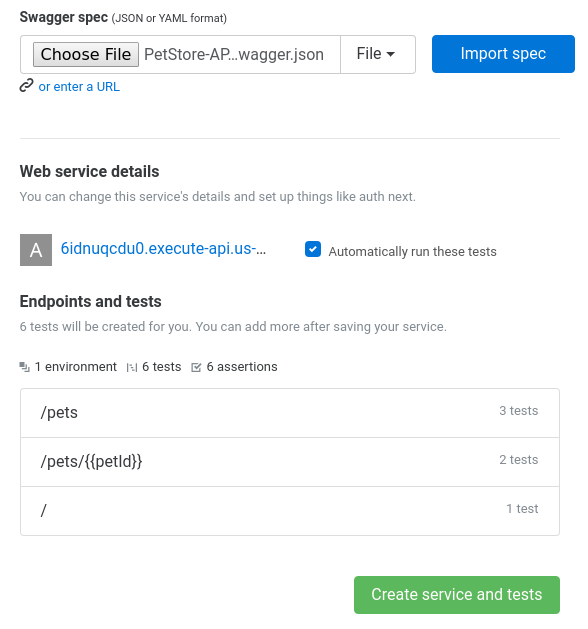 For this example, I'll be set up the default Example API, which uses the Swagger PetStore example to create some default endpoints and HTTP methods. If you have an existing API, or want to use this opportunity to start creating your own, that's perfectly fine - you don't have to use the default example. You have a new API managed in AWS! Next, the API needs to be deployed to a stage make it publically available. This step is also required before the API can be exported from the console. After you've filled out the form to your liking, click Deploy. Success! On the next page, you will see details about the API's deployment stage including an Invoke URL where your API can be accessed, and various other settings for managing your API. With a new API created and deployed, we can export the API specification to a format that can be imported into Assertible. Assertible supports creating automated tests from a swagger spec, so you can export your API from the API Gateway console as a JSON or YAML Swagger spec and import it to get everything initially set up. And that's it. A file should be downloaded for your Swagger spec, which can be used n the next steps. Learn more about exporting an API from AWS and other API formats Assertible supports. Assertible will create API tests for each endpoint/method combination in your Swagger spec. If you don't have account already, you can create a free one here. A dry run of your endpoints, tests, and environments is shown before fully importing the spec. Click Create service and tests to finalize the import and go to your web service overview. With an initial set of tests created for the API, you can set up automated monitoring to run them on a schedule. Assertible support various types of API test automation (check out the docs), and for this example I'll set up hourly schedule monitoring. You can choose between hourly and daily schedules on the free plan, and start the monitoring at a specific time. When you've confirmed the details, click Create schedule. If you need more frequent schedules, you can upgrade your account. The API tests are now passing and running a schedule! Now you can continue to configure the rest of your settings like hooks and alerts. Assertible has support for sending API test results to a slack channel or sending emails after test runs. Both of these can be configured from the Hooks & Alerts page of the Settings tab on your web-service. Techniques to reduce api testing errors and improve your QA process. 4 common API errors and how to test them. Have any questions, questions, or something to add? Shoot me a message on Twitter and let me know. Check it out and sign up for a free Assertible account to start testing and monitoring your API Gateway.